Recognising the importance of the Pacific, Prime Minister Turnbull has called for a ‘step-change’ in Australia’s engagement with the region. The profound development benefits that can be delivered to our nearest neighbours through greater access to Australia’s labour market is an element missing from the current migration debate. Allowing just 1 per cent of the Pacific’s population, an average intake of under 3000 people, to work permanently in Australia would deliver more benefits to the Pacific peoples by 2040 than Australia’s current aid program. A stable and prosperous Pacific Islands region is essential for Australia’s security and foreign policy. Australia is investing significant amounts of aid in the development of the region with very mixed results. The economic, demographic, governance, and climatic challenges the Pacific faces will make sustained development of the region even more difficult in the years to come. It is for this reason that Prime Minister Turnbull has committed Australia to a ‘step-change’ in Australia’s engagement with the Pacific built on fresh ideas. One idea that would produce a ‘step-change’ would be to make it easier for citizens of the Pacific Islands region to work in Australia. This would allow citizens of the region to earn an income far above their potential at home, and considerably improve their living standards. This Analysis assesses the impact of two models of such a proposal: one capped and one uncapped. It finds that allowing just 1 per cent of the Pacific’s relatively small population to work in Australia would bring more benefits to the people of the Pacific than what Australia currently gives in aid. Measures would need to be taken to manage risks and costs to Australia; however, these risks should be weighed against the significant benefits it would bring to Pacific Islanders. A step-change in our engagement is indeed necessary, because the development prospects of many of Australia’s neighbouring Pacific Island economies are bleak. Disadvantaged by remoteness from major markets, small market size, weak governance, and rapidly growing populations, it is difficult for Pacific economies to follow conventional pathways for economic growth. There is certainly no track record of success. The average annual income of people in these economies in 2015 was around $3900 (purchasing power parity (PPP) adjusted in current international dollars), just 8 per cent of the Australian average. Australia has a strong interest in seeing a stable, prosperous, and developed Pacific. The region is part of Australia’s near neighbourhood. Former Australian Prime Minister John Howard memorably referred to the Pacific as “our patch”. Australia and New Zealand are the first countries that Pacific Island states look to for assistance after natural disasters or conflict. A stable Pacific is critical to Australia’s security. It is also an area where Australia has significant economic interests, including close to US$1.5 billion in trade per annum and US$15 billion worth of investments. The importance of the Pacific Islands region to Australia is further reflected in the amount of aid that Australia has invested in the region. In real terms it has given over US$40 billion since 1960. This is almost two-thirds of total Australian aid over that period. The results of this assistance have been mixed at best. While aid has improved welfare and governance throughout the Pacific, as a whole the human development indicators of the region remain poor. There are limits to what foreign aid alone can achieve. It is too finite, its delivery too fragmented, and it is too limited in its ability to change domestic incentives in developing countries to have a deep impact. Aid helps, but in the Pacific it has rarely been transformative. Meanwhile, the challenges facing the Pacific Islands region are growing. Globalisation has not overcome the problems of remoteness and size as was hoped. Progress on governance remains stalled in many countries. Natural disasters and climate change will be major obstacles to future development. Compounding this, the region’s population, already facing a significant youth bulge, is expected to grow by a further 49 per cent in the next quarter of a century. By contrast, Australia’s population will grow by 29 per cent. Any incremental improvement in development indicators across the Pacific region in coming years is likely to be overwhelmed by these challenges. At best, current approaches to development in the Pacific will see the region continue to muddle through; at worst, the region’s development levels will decline to a point where some states in the region will become unstable and, in some cases, unviable. It is time, therefore, to debate fresh ideas that will translate Prime Minister Turnbull’s call for step-change into action. One idea that has already been floated in a variety of forms would be for Australia to allow a significant number of Pacific Islanders to work in Australia. This would enable citizens from Pacific Island countries to earn an income far above their potential at home and considerably improve their living standards. It would also open opportunities to the Pacific Island community that are far beyond what would otherwise be within reach. Indeed, in a recent radio interview Prime Minister Turnbull acknowledged the connection between providing greater access to the Australian labour market and improving development prospects in the Pacific. The Prime Minister’s comment was delivered in the context of what has become an increasingly polarised debate about both skilled and unskilled labour migration to Australia, and, in particular, the impact of this on Australian workers. What has largely been missing from that debate, however, has been consideration of the development benefits that could be delivered to Australia’s nearest neighbours by increasing their access to Australia’s labour market. The aim of this Analysis is to calculate those benefits. It does so by considering two models for increasing Pacific access to Australia’s labour market: one that would allow for relatively unrestricted access (hereafter the ‘uncapped model’); and a second model that would provide for more restricted access (hereafter the ‘capped model’), whereby a lottery quota system would be used to control the flow of Pacific Islanders who could come to Australia per year. The uncapped model illustrates the full transformational impact such a proposal could have on the region. Based on very conservative assumptions, the uncapped model could increase the income of some Pacific Island countries by around 300–400 per cent over the next 25 years. To be clear, that is the increase in income for the entire population of those countries, not just the income of those who have migrated. While the less ambitious capped model would obviously have a less transformational impact on the people of the Pacific Islands region, it would still deliver benefits far greater than Australia’s existing aid program. Our estimates reflect a view of development as something that affects people rather than place — if a policy lifts many Pacific Islanders out of poverty, it matters little where it happens. We are conscious that this focus is a different way of thinking about development, but conventional thinking is clearly not working in the Pacific. There are, of course, risks and costs associated with either model and this Analysis explores some of these, as well as ideas that might help to mitigate them. In 2006 a seminal report published by the Australian Agency for International Development (AusAID) highlighted the poor development performance of Pacific Island countries. The region, the report noted, suffered from high unemployment, social and political instability, and serious crime. Some countries also faced daunting health and environmental challenges. Without an upturn in economic growth, the future for these countries was bleak. A decade on, that statement remains true. Aid and remittances have played an important role in avoiding a failed Pacific region. However, at best, the Pacific continues to muddle through, unable to achieve a stable economic or human development growth path. The twin tyrannies of small size and extreme isolation have made it all but impossible for regional states to follow a conventional growth path, and have left the Pacific as the most aid-dependent region in the world. Scholarship on global growth and development over the past two decades has shown that institutions are critical to development. However, institutional quality in the Pacific is low and shows few signs of improvement. There are worrying trends in some countries towards further consolidation of power for the elites. Furthermore, the pressures on the Pacific are only likely to get worse. The Pacific is one of the world’s most natural disaster prone regions, contributing average annualised losses of 6.6 per cent of the GDP for Vanuatu and 4.4 per cent of the GDP for Tonga alone. 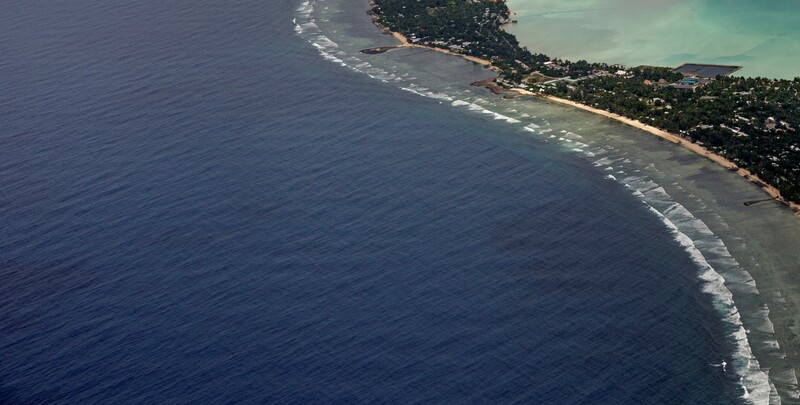 Climate change will exacerbate these vulnerabilities, increasing the intensity of natural disasters and threatening the entire existence of atoll states, such as Kiribati and Tuvalu. Demographic challenges add to these problems. The median age in Melanesia is 22, while in Polynesia and Micronesia it is 26. Australia’s median age is almost double that at 37.5. This dramatic youth bulge shows no prospect of slowing down, with the population of the region forecast to grow by 49 per cent over the next 25 years, again double the forecast for Australia. These trends will severely test the resilience of Pacific Island states and prevent them from prospering. For the Pacific to have a chance at greater prosperity in the face of these looming challenges, the Australian Government needs to consider new and different solutions. One approach would be to significantly increase the opportunity for Pacific Islanders, regardless of their skill level, to live and work in Australia. To illustrate the effect greater labour mobility could have in the region we have modelled the impact of effectively extending the Australian labour market to include the Pacific Islands. In this uncapped model there would be no numerical restrictions on the numbers that could come to live and work in Australia. It should be noted that the uncapped model would not, however, see the abolition of passport and border controls, as occurs in the Schengen Area of the European Union. Rather, under this proposal, a special visa category would be created, similar to the subclass 444 visa that allows New Zealanders to stay and work in Australia, with certain restrictions. Similar to the New Zealand agreement, Pacific Islanders would need to pay for their own passage to Australia, and be responsible for their own needs once they arrive. The granting of visas would still be subject to health checks, as with other visa classes, to ensure that migrants are not entering Australia to take advantage of the healthcare system for pre-existing conditions. A character test would also be required. Conditions would also need to be set on the visa to ensure that the scheme did not create a pathway for economic migrants from other parts of the world. When determining how many Pacific Islanders would come to Australia under the uncapped model, the closest analogue for assessment is the access that citizens of Micronesia, the Marshall Islands, and Palau have to the United States under the Compact of Free Association. The Compact is an agreement between these three countries and the United States. It evolved from the post-Second World War United Nations trusteeship of the islands, which was administered by the US Navy and the US Department of Interior. The Compact has encouraged large-scale migration of these populations to the United States since it was permitted, beginning in 1986. For example, Micronesia has ‘lost’ about one-third of its potential population to Guam, Hawaii, and the US mainland. Expanding the opportunities for Pacific Islanders to permanently engage in Australia’s labour market would be a natural progression of other initiatives promoting labour mobility in the Pacific. The Australian Government already runs a maturing Seasonal Worker Programme, and is piloting a two-year workers program for i-Kiribati, Tuvaluans, and Nauruans in the Northern Territory. The World Bank, in partnership with the Australian National University, has completed a major review into labour mobility reforms for the region. The assumptions behind the uncapped model are detailed below and in Annex A. The benefits of the uncapped model are shown in Table 1. According to our calculations, income increases of over 400 per cent by 2040 are possible. In total, incomes would increase by around $25 billion (2005 PPP adjusted US$). Australia’s current aid budget for the Pacific Islands is around $600 million (2005 PPP adjusted US$). Without factoring in the costs of overhead, implementation, and potential project failure, and assuming aid volumes do not dramatically change, the proposal would bring over 40 times the benefit to Pacific Islanders by the year 2040. The benefits would vary across countries in the region. There are two main reasons for this. First, the increase in income depends on what an immigrant would have earned in their home country, which varies. Second, countries differ based on the number of immigrants who would arrive under this scheme. For example, because the number of Samoans in Australia by 2040 will already be so large under business-as-usual projections, we estimate no benefit to the people of Samoa under this model. In estimating these massive benefits our calculations are shaped by six principal assumptions. A more detailed explanation of these and other assumptions can be found in Annex A and a full data set of our workings is also available online. First, our model includes eight Pacific countries with a total combined population of 9.8 million: Fiji, Kiribati, Papua New Guinea, Samoa, Solomon Islands, Tonga, Tuvalu, and Vanuatu. We have not included Pacific Island countries that are not members of the World Bank because there is insufficient data for inclusion in the model. We have also excluded states in the Northern Pacific that already have free access to the United States, for which we assume the proposal has no effect. Second, the metric we focus on is the change in income of the citizens of the Pacific Islands, regardless of where they live. This metric is not something that is regularly calculated by statistical agencies. However, the metric is the basis of World Bank calculations in their recent labour mobility analysis of the Pacific, where they refer to the measure as the change in “gross national income+” (GNI+). We also focus on PPP measures, which take account of the different costs of living in Australia compared with the Pacific. Third, we assume that around a fifth of the population of smaller Pacific Island countries would move to Australia under the uncapped model based on the experience of the Compact countries. Between a fifth and a third of the population of Compact countries moved to the United States after the labour mobility provisions came into effect. It is also worth noting that the total number of people that moved from the Compact countries did not move immediately, but did so over the course of at least two decades. It is, of course, difficult to predict how many would choose to move under the uncapped model. But it is worth remembering that there would still be significant obstacles to people moving. Pacific Islanders would need to find the money to relocate themselves and their families. They would also, as noted above, still need to pass health and character checks associated with gaining a visa. Nevertheless, under the uncapped model it is possible that more people will move than we have anticipated. In this case the benefits of the scheme to Pacific Islanders will be greater, although the risks and costs to Australia would also increase. Even in the uncapped model we would treat Papua New Guinea as a special case. Under business-as-usual assumptions, it will have a population of 11.7 million by 2040. One-fifth of that population would amount to 2.4 million immigrants, which compares to only an extra 350 000 migrants from all the other Pacific countries combined (Table 1). These large numbers would be very challenging for Australia to absorb, and therefore we assume a cap for Papua New Guinea that would limit the number of immigrants to 5 per cent of the total population. We expect that this quota would be filled, but there are some reasons to believe it may not. The remote geography of Papua New Guinea provides further barriers to migration compared with other Pacific Island countries, and only about 10 per cent of the working-age population are engaged in the formal economy. There is, of course, a stock of existing immigrants from Pacific Island countries in Australia (Table 2). Even without this proposal, the stock will increase under a business-as-usual scenario, and we have taken that into account. We assume that the stock of immigrants from each country, in the absence of this model, will continue to grow at the 2000–2015 rate. We also assume that migrants would have received their home country’s forecast GDP per capita had they stayed at home. Fourth, we focus on what the effect of this proposal would be in 2040. We have selected 2040 for a number of reasons. The 25-year horizon to 2040 is close to the 30 years of free access that has been available under the Compact of Free Association. This enables us to base some of our calculations on that agreement. Also, our calculations are based on a set of modelling conducted by the World Bank that does not extend beyond 2040. Finally, the short-term effects of this policy are likely to be marginal. A diaspora of Pacific Islanders needs to grow within Australia and employment networks need to form before the policy will take full effect. This was the case for the Compact, where migration started as a trickle. Fifth, we assume that the average immigrant to Australia in 2040 will earn $30 000 (2005 PPP adjusted US$). We justify this in Annex A, but this is conservative. According to the OECD’s long-term projections, Australia’s GDP per capita by 2040 will be $63 500 (2005 PPP adjusted US$). It is also likely that this income would be below the minimum wage that will prevail in 2040 for a full-time employee. However, it should be noted that this is an average across all migrants, and not all migrants will work full-time, especially dependents. Sixth, we assume there is no effect on GDP per capita in the source countries. While remittance flows will increase, we do not assume this will affect home country GDP. Remittance income will no doubt affect welfare in the home country. Those receiving remittances will be able to purchase more. However, we are already counting remittance flows from Australia to the Pacific as part of the increase in income of those who move. Remittances are just a transfer from the migrants to those back home. In order to provide a permanent increase in GDP, remittances need to improve the productive capacity of an economy. Remittances will not affect the amount of labour in an economy, and while they could affect productivity levels, these effects would be uncertain. There is a more plausible effect on capital if remittances relax credit constraints. Actual empirical evidence of the efficacy of remittances is, however, weak. Therefore, we assume the effect is zero. There may be some argument that, with a lower population, GDP per capita in the sending countries could increase. That is possible, but it is worth noting that by itself, a country’s population size has virtually no effect on per capita incomes. Moreover, per capita incomes in the Compact states have not shown a different trend to other Pacific Island countries. This is all consistent with the dominant development perspective that it is institutions which determine the productive capacity of an economy. The risks such a model could potentially have on sending communities more broadly is discussed below. There are a number of risks raised by the model, as well as obstacles to its implementation. Four stand out in particular. The first relates to Australia’s immigration numbers. Under current projections Australia is expected to add an extra 215 000 permanent migrants per year, adding 5.16 million people to our population by 2040. We calculate that the uncapped model would add another 900 000 Pacific Islanders to this total over the same period, increasing the additional migrant stock in Australia from 5.16 million to 6.04 million. Seen another way, these additional Pacific migrants would comprise about 2.5 per cent of Australia’s population in 2040. In total terms, over a period of almost 25 years, this would not represent a huge increase in overall migrant numbers. Obviously, in the context of the current fraught debate about migration in Australia, gaining support for even this increase will be difficult. But we do not think it would be impossible. Lowy Institute polling has consistently shown strong public support for immigration. In response to six different statements about immigration and immigrants, most Australians (73 per cent) agree that “overall, immigration has a positive impact on the economy of Australia”. There is more public concern about losing control of borders and the management of immigration. As already noted, even under our uncapped model, prospective migrants would still require a visa and would still go through health and character checks. It is also worth noting that Australia has in the past successfully absorbed large numbers of migrants, many of them unskilled. For example, the post-war migration boom helped drive rapid population growth. In a period of ten years, Australia’s population went from around 8 million to over 10 million from 1950 to 1960, an increase of 25 per cent. Immigration accounted for more than half of this increase and Southern Europeans, who were generally unskilled, were an important part of this boom. This migration boom, and its Southern European influence, has been a great success, and forms an integral part of Australia’s contemporary identity. The uncapped model we are proposing would only add 2.5 per cent to the Australian population over a period of around 25 years, a much more modest increase. A second risk relates to the way that this proposal would affect the character of Australia’s immigration program as well as Australia’s labour market. In recent years, Australia’s immigration program has largely focused on attracting skilled migrants. In effect the uncapped model would create a new ‘Pacific development’ category of visa, adding to the other major categories: skilled, family, refugee and New Zealand (444) categories. The justification for such a category would be our national commitment to supporting the people of the Pacific Islands, Australia’s nearest neighbours. But the model could also be justified in terms of future labour needs in Australia. The increased stock of low-skilled workers would help to address some of the labour market shortfalls Australia is set to face. For example, in the aged care industry alone, the workforce is set to expand from 201 600 as at 2011 to over 500 000 in 2040. It seems unlikely that the workforce, under current projections, will meet this need in its entirety. This is just one illustration of a sector where demand for labour will be inadequately met by the domestic market. Pacific Island workers provide one solution. An increase in the relative supply of unskilled workers in Australia could, of course, have a negative impact on the wages of unskilled workers in Australia. We estimate it could decrease wages for low-skilled workers by 2.5–5 per cent. By the same token, the wages of other workers could be affected in a more positive way. Under this proposal, skilled workers will become a smaller proportion of the overall workforce. Their relative supply will fall, and their wages will increase. Nevertheless, there are reasons to expect that, in the long run, the average wage of Australian residents will be little affected by the uncapped model, if at all. Detailed analyses of migration have assumed that the average wage is invariant to migration. In these analyses, the capital stock will increase if migration increases. The capital stock will increase because the increase in labour supply will make capital more productive, encouraging more capital to be produced. As the capital stock increases, that will in turn make labour more productive, and push wages up, countering any downward pressure arising from the extra migrants. If the average wage is little affected, then the tax and transfer system can be used to compensate those affected. In Australia, we have seen many examples where those who have been negatively affected by policy changes have been compensated. On a large scale, the introduction of the Goods and Services Tax saw efforts to compensate those affected. On a smaller scale, dairy deregulation saw significant compensation paid to dairy farmers, and more recently the West Australian government has paid compensation to taxi-plate owners after the state government legalised ride-sharing services. Third, the model may contribute to the creation of a welfare-dependent underclass in Australia. This is a risk that is created by any program that imports unskilled labour into a country. A glimpse of what may occur can be gained from considering the existing Samoan population in Australia. Currently, New Zealand offers 1100 Samoans annually the opportunity to live and work in New Zealand indefinitely. This provides a pathway to New Zealand citizenship for Samoans, who can then move to Australia under the subclass 444 visa. This is an opportunity that many Samoans have taken. Many of the Samoan-born population in Australia arrive under similar conditions to that envisaged in our model, albeit via an alternative route. The outcomes for the Samoan-born population have been mixed. On the one hand, the median income of the Samoan-born population is around the median for the overall overseas-born population, a notable achievement considering the mixed skill level the Samoan migrants bring with them. On the other hand, the labour force participation rate is slightly below the Australian average, and the unemployment rate is 4.6 percentage points higher. This is not unexpected, however, given they are lower skilled, and lower-skilled Australians generally underperform on these metrics. Under either model, access to the welfare and other benefits would be limited to prevent the possibility of people coming from the Pacific to exploit the Australian social welfare service. This is the case with New Zealand citizens arriving on the subclass 444 visa. For example, they face a ten-year wait before having access to the Newstart Allowance. However, special assistance outside of normal unemployment benefits could be provided to the migrants to help them re-enter the workforce if they fall into unemployment. This assistance could then be repaid through the taxation system via a levy akin to HECS. We believe it makes less sense to restrict access to health and education benefits, particularly given that the migrants will be working and paying taxes. A fourth risk associated with the model is its potential negative impact on those left behind in the Pacific. There is a possibility that the economic development within the Pacific Island countries will be harmed by hollowing out their working-age population and leaving the countries bereft of citizens with valuable skills. In development circles this is known as the ‘brain drain’. Globally, evidence of the deleterious consequences of brain drains is far from conclusive. For example, even though the Philippines is a developing country from which more nurses depart to work in rich countries than any other, there are about six times as many nurses per capita in the Philippines than there are in countries at a similar level of income. Filipinos seemingly respond to the demand overseas by investing heavily in nursing training, but not all of them leave permanently. In the case of the Pacific, there is already the risk of a brain drain in the form of the existing pathway for skilled migrants to come to Australia through the 457 visa program. Considerable numbers of Pacific Islanders have already come to Australia under the scheme. It is true, however, that obtaining a 457 visa is not straightforward and can be relatively expensive, so it is possible that there would be an increase in the flow of skilled migrants from the Pacific under this proposal. It is also noteworthy that in the case of the Compact example noted above, GDP per capita in the Compact countries seems to be little affected by the access their citizens have to the United States labour market. All the risks and obstacles to the model of Pacific labour mobility are serious. Yet we believe the risks are outweighed by the enormous benefits such a model would provide to the Pacific. A less ambitious option that would help mitigate these risks and obstacles but would still provide labour opportunities for Pacific Islanders in Australia would be the implementation of a capped model. Under the capped model an annual immigration quota would be imposed. This would help to mitigate some of the risks and costs identified above, and give the government an extra degree of control over labour movement, while still delivering real benefits to the Pacific Islanders. This capped model would be based on a lottery-style system to ensure that skilled and unskilled Pacific citizens have an equal chance of accessing the labour market. This would minimise unintended consequences, for example exploitation of the scheme by the Pacific elite. The most important decision to make in relation to a capped model would be the size of the quota. It should be both large enough to actually have a significant impact in the Pacific, but small enough to reduce the downside risks and costs to Australia. Ultimately, the exact number will be determined by whatever is politically palatable. The interactive table below can be used to explore the impact, in terms of the total benefit for the Pacific Island people, for varying levels of migration. Our numbers in the uncapped model had 20 per cent of the ‘business-as-usual’ population moving to Australia by 2040; the table models alternative percentages lower than that figure. We also provide the option of removing PNG from the model, because of the distortionary impact a country of its size has on the overall results. If the cap were set at 10 per cent this would deliver a benefit to the Pacific Island citizens that would be seven times the value as our existing aid program. This would result in an annual quota of roughly 5460 people coming to Australia, spread proportionately among individual countries. If the cap were set at 5 per cent, this would deliver a benefit to the Pacific Island citizens that would be three times the value as our existing aid program. This would result in an annual quota of roughly 2530 people coming to Australia. Even if the cap were set at 3 per cent this would still provide more benefit to the people of the Pacific than our existing aid program and require an annual quota of roughly 1370 people. If the cap were set at 5 per cent, this would deliver a benefit to the Pacific Island citizens that would be 29 times the value of our existing aid program. This would result in an annual quota of roughly 23 900 people coming to Australia, three-quarters of which would come from Papua New Guinea. If the cap were set at just 1 per cent this would deliver a benefit to the Pacific Island citizens that would be three times the value of our existing aid program, and require an annual quota of roughly 2850. This Analysis has set out to show the significant development benefits that could be provided to the people of the Pacific if they were granted greater access to Australia’s labour market. By modelling a relatively open labour market between Australia and the Pacific we show that the annual income for those who migrate could increase by around $25 billion (2005 PPP adjusted US$), benefits that are around 40 times Australia’s current aid budget to the region. Further opening Australia’s labour market with the Pacific will also serve Australia’s interests. By easing population pressures, it will help Australia’s aid budget achieve better outcomes in the Pacific. It may also help in addressing some shortages in the labour market, such as in aged care. We believe these massive benefits to the Pacific Islanders outweigh the potential risks that the proposal poses — risks that can also be managed and be mitigated through effective policy design. But even if the number of visas provided to Pacific Islands citizens were restricted through a quota and lottery-based system, it would still deliver enormous benefits. Even when excluding Papua New Guinea, allowing just 3 per cent of the Pacific’s forecast population into Australia by 2040 would provide more benefit directly to individuals than Australia’s current aid program. The Pacific Islands region faces intimidating development challenges. Problems of geographical remoteness and small market size appear insurmountable. The prospect of even partially addressing those challenges through significant amounts of Australian aid are slim. The Turnbull government is eager to engage with the Pacific in more innovative ways to ensure our nearest neighbours can be secure and prosperous. We hope this Analysis will contribute to that debate. The number of extra people moving is given by the following. We use the experience under the Compact of Free Association to help inform our migration assumptions. Under agreements that form the Compact and came into effect in 1986, citizens of the Federated State of Micronesia and the Marshall Islands have access to the labour market of the United States. Palau signed their agreement in 1994. This access is not a path to citizenship, but migrants are eligible for certain benefits. The number of Micronesians in the United States is uncertain. Levin suggests that there are around 25 000 Micronesian immigrants on the US mainland, about 15 000 on Guam, and around 10 000 in Hawaii. Given a total population remaining in Micronesia of around 100 000, Micronesia has ‘lost’ around a third of its population under the Compact agreement. According to the OECD database of migration, there were 14 387 Marshallese in the United States in 2011, which does not include Guam. That is the only year for which there is data. According to the World Bank, the population of the Marshall Islands was 52 541 in 2011. Therefore, it looks like the Marshall Islands has ‘lost’ around one-fifth of its population, although these numbers are imprecise. The American Community Survey is the source data used in the OECD database of migration, and that may have problems associated with response rates and sampling error. There are no data available for Palau, but there are other statistics on which we can base our estimate. The US Census asks which race people belong to, and is specific about different races within the Pacific Islands. This is different to asking about birth. In the 2011 census, 22 434 people identified themselves as Marshallese, around 40 per cent of the home population. For Palau, 7400 people did so, again 40 per cent of the population. Therefore, this gives some support for the proposition that movement rates from Palau and the Marshall Islands have been similar. The data available suggest that these countries have ‘lost’ between a third and a fifth of their population. Alternatively, we could have based our calculations on the experience of the Cook Islands, Niue, and Tokelau. These islands have open access to New Zealand, and their migration rates are much higher. For example, there are 60 000 people who identify as Cook Islander in New Zealand, and 15 000 in the Cook Islands themselves. However, people from those countries have New Zealand citizenship, and therefore migration to New Zealand is much more attractive than our proposal. Moreover, there are deep historical and cultural ties between these countries and New Zealand. While the incentive to move to Australia under the uncapped model may be higher with a lower GDP per capita, the means to do so will not. Under both models we envision that people will pay for their own passage to Australia, and be responsible for their own needs when they arrive. Therefore, assuming a migration rate that is invariant to income is not unreasonable, at least for the ranges of incomes we consider. The baseline population data we use for the Pacific Islands is from the 2015 Revision of the United Nations World Population Prospects publication. These population totals take account of migration. Therefore, it is not counting every person born in the Pacific Islands. As a result, taking this as a base may be an underestimate of the fifth of the population that will be ‘lost’ due to this proposal, which will lead to an underestimate of the benefits. Several countries have large emigrant populations in Australia, and they continue to grow. Samoa, Fiji, and Tonga are cases in point, the other Pacific Island countries that we focus on in this study less so. Business-as-usual projections could be done in a number of ways. We chose to assume that the growth of these migrant populations continue at their 2000–2015 average rate. The data we use are the estimates of the resident population in Australia by country of birth from the Australian Bureau of Statistics. We assume there is no change in per capita GDP in the sending country as a result of migration. It is hard to see any effect on GDP per capita as a result of the Compact of Free Association. The figure below shows of these countries’ GDP relative to the United States. The solid lines are the countries of the Compact, the dotted lines are some selected Pacific countries not in the Compact. First, the solid lines do not appear to slope upward. Second, they do not appear very different from countries not in the Compact. As our unit of account, we use 2005 PPP adjusted US dollars. We do this because we follow World Bank projections from which we base Pacific Island GDP projections. If we were to use the alternative 2011 international dollars, then that may have substantial effects on the percentage change in GDP. That is because the 2011 round of the International Comparison Program (ICP) seems to have made many Pacific Island economies far richer, relative to the United States, compared with the 2005 round. However, this will not materially affect the dollar gains, apart from the effects of inflation. As an offset, Australia is also relatively richer compared with the 2005 round, so the increase in incomes will be larger. Several sources can be used to determine what the people of the Pacific Islands would earn in Australia. First, the 2011 Census asked individuals what their weekly earnings were, as well as their place of birth. The weekly earnings are provided in buckets, so if we assume each person in the bucket earns the midpoint of the range, we find that the average Pacific Island-born resident of Australia earned an annual income of around A$35 000 in 2011. It would be somewhat unlikely that the people from the Pacific that are already here are representative of the people that would come under either the capped or uncapped model. For example, those already here may be skilled migrants, or here as part of a commercial or government job associated with an entity of their home country. That may suggest that the A$35 000 figure is an overestimate for those who would come, given that they would likely be less skilled. On the other hand, the A$35 000 figure includes everyone, even students, spouses, and children. Given the nature of the models we are proposing, we suspect that the people that would come under this proposal would be more concentrated in the working-age demographic than existing migrants. If we were to try to get a better picture of the income of unskilled migrant workers, then there is an experimental data set constructed by the Australian Bureau of Statistics which may be of use. This data set, which links tax records to immigration records, suggests that the average humanitarian visa holder, who would likely be unskilled, earned A$28 000 in 2010/11. The average family visa holder, which is one of the few other channels by which unskilled migrants can move to Australia, earned A$41 000. As a result, we view as a reasonable estimate, perhaps on the conservative side, that the average person under this proposal would have earned A$30 000 in 2011. We make this assumption. We then assume real wages will increase by 2 per cent per year up to 2040. This translates into $53 000 in 2011 Australian dollars, or $30 000 in 2005 PPP adjusted US dollars. Estimating the effect on the wages of each class of worker is a difficult task, and would involve the introduction of some complicated modelling machinery. Some rough estimates, however, are instructive. The average assumed wage of A$30 000 in 2011 accords roughly with the average wage of the lower half of wage earners. Therefore, as an approximation, we could suppose that the immigrants will compete with the lower half of the labour force. The 2015 Intergenerational Report suggested the total population of Australia will be around 34 million in 2040, with the labour force at around 17 million, meaning the migrants may be competing with around 8.5 million Australian residents. We estimate that around 885 000 migrants would come under this proposal, which would increase the unskilled labour force by at most 10 per cent because not all migrants will be in the labour force. Estimates of the elasticity of the wage rate to labour supply are uncertain. Lichter et al (2015) ran a meta-analysis over 924 estimates, with an average elasticity of –0.51, and a median elasticity of –0.39. If we were to take the larger of these, this would mean a 5 per cent fall in wages relative to the case without this proposal. On the other hand, if we were to assume that only half the migrants coming in would be in the labour force, then this would mean a 2.5 per cent fall in wages. This is obviously subject to many qualifications. It may be that the workers from the Pacific compete with a narrower class of worker, so the effects may be more acutely felt by a smaller fraction of the workforce. On the other hand, it may be that workers from the Pacific are so different from native workers, and perform tasks that would simply not otherwise get done, that they have very little effect on anyone’s wages. However, as noted above, the important point is that if capital responds, under a wide class of models, Australian native workers will be little affected and may even be better off. The tax and transfer system can then be used to compensate the losers. The calculations provided in this proposal are relatively simple. An alternative could be to introduce a complicated computable general equilibrium model. While this modelling machinery can be helpful, we do not think it is necessary to make the main point of our proposal. The biggest effect of this proposal is the increase in income of the migrants. We think it unlikely that any general equilibrium mechanism will substantially change that. For example, it is difficult to countenance second-round effects that would substantially change, on a net basis, the tenfold increase in income that the average immigrant from Vanuatu, for example, would see. Malcolm Turnbull, “Remarks at Pacific Island Forum – Micronesia”, 9 September 2016, https://malcolmturnbull.com.au/media/remarks-at-pacific-island-forum-micronesia. The Pacific Island economies that we focus on in this study are Fiji, Kiribati, Papua New Guinea, Samoa, Solomon Islands, Tonga, Tuvalu, and Vanuatu. They are members of the World Bank and do not already have some form of migration agreement with developed nations. International Monetary Fund, World Economic Outlook Database (Washington, DC: IMF, 2015), https://www.imf.org/external/pubs/ft/weo/2016/01/weodata/index.aspx. Mark Forbes, “Pacific Leaders Back Australian Role”, The Age, 9 August 2004, http://www.theage.com.au/articles/2004/08/08/1091903444430.html. Australian Bureau of Statistics (ABS), “5368.0: International Trade in Goods and Services, Australia, Aug 2016”, Table 14a; ABS, “5352.0: International Investment Position, Australia: Supplementary Statistics, 2015”, Table 5. Certain data sets that we have relied on for some of our assumptions are only available in US dollars, so for consistency all values in this Analysis are measured in US dollars. Organisation for Economic Development and Co-operation, “Query Wizard for International Development Statistics”, https://stats.oecd.org/qwids/. See United Nations Development Program, Asia-Pacific Development Report 2016, http://hdr.undp.org/sites/default/files/rhdr2016-full-report-final-version1.pdf. United Nations, Department of Economic and Social Affairs, Population Division, World Population Prospects: The 2015 Revision, https://esa.un.org/unpd/wpp/. AusAID, Pacific 2020: Challenges and Opportunities for Growth (Canberra: Public Affairs Group, AusAID, 2006), http://www.americansamoarenewal.org/sites/default/files/resource_documents/doc.pdf. Daron Acemoglu and James A Robinson, Why Nations Fail: The Origins of Power, Prosperity and Poverty, 1st edition (New York: Crown Publishing Group, 2002). See World Governance Indicators, http://info.worldbank.org/governance/wgi/index.aspx#home. For example, Constituent Development Funds in Papua New Guinea and the Solomon Islands as a proportion of total government expenditure are globally in leagues of their own. See M Baskin M Mezey (eds), Distributive Politics in Developing Countries: Almost Pork (Lanham: Lexington Books, 2014). World Bank, “Pacific Possible: Climate Change and Disaster Resilience”, World Bank Group, Washington, DC, 2016, http://pubdocs.worldbank.org/en/720371469614841726/PACIFIC-POSSIBLE-Climate.pdf. United Nations, World Population Prospects: The 2015 Revision. See the ‘Assumptions’ section for more details. New Zealand has a similar arrangement with Cook Islands, Niue, and Tokelau; however, these relationships grant citizenship, which is not what we are proposing. Michal Levin, “Micronesian Migration in Historical Perspective: Based on FSM 2010 Census of Population and Housing and other Studies”, Division of Statistics, Federated States of Micronesia Pohnpei, 2014. Richard Curtain, Matthew Dornan, Jesse Doyle and Stephen Howes, “Pacific Possible, Labour Mobility: The Ten Billion Dollar Prize”, World Bank Group, July 2016, http://pubdocs.worldbank.org/en/555421468204932199/labour-mobility-pacific-possible.pdf. These estimates are at purchasing power parity (PPP), which takes into account the different cost of living in Australia. Aid may increase the GDP of the recipient country, although this is an empirically contentious proposition: see Andy Sumner and Jonathan Glennie, “Growth, Poverty and Development Assistance: When Does Foreign Aid Work?”, Global Policy 6, Issue 3 (2015), 201–211. Even if it did, any reasonable effect would still be completely overshadowed by the estimated impact of our proposal. The full Pacific labour data set is available at https://www.lowyinstitute.org/sites/default/files/pacific-labour-calculations.xlsx. Nauru only became a World Bank member in 2016 and, as a result, Nauru was not included in the projections from the Pacific Possibilities Project that we rely on for our calculations. Curtain et al, “Pacific Possible, Labour Mobility: The Ten Billion Dollar Prize”. This includes migrants and the descendants of migrants. ADB, “Pacific Economic Monitor, Midyear Review”, Asian Development Bank, Manila, 2014. We make our calculations using 2005 PPP adjusted US dollars. We do this because this is what the Pacific Possible project used, and we used their numbers for some of our calculations. It is also adjusted for purchasing price parity across countries. See Annex A for a discussion of some of the consequences of this choice. Michael Clemens and David McKenzie, “Why Don’t Remittances Appear to Affect. Growth?”, Policy Research Working Paper No 6856, World Bank, Development Research Group, May 2014, http://documents.worldbank.org/curated/en/114141468323950998/Why-dont-remittances-appear-to-affect-growth. Andrew K Rose, “Size Really Doesn’t Matter: In Search of a National Scale Effect”, Journal of the Japanese and International Economies 20, Issue 4 (2006), 482–507. Commonwealth of Australia, 2015 Intergenerational Report: Australia in 2055 (Parkes, ACT: The Treasury, 2015), http://www.treasury.gov.au/PublicationsAndMedia/Publications/2015/2015-Intergenerational-Report. ABS, “3105.0.65.001 – Australian Historical Population Statistics, 2014”, http://www.abs.gov.au/ausstats/abs@.nsf/cat/3105.0.65.001. Department of Immigration and Multicultural Affairs, Immigration: Federation to Century’s End (Belconnen: Commonwealth of Australia, 2001); Lisa Thompson, Migrant Employment Patterns in Australia: Post Second World War to the Present, AMES Research and Policy Unit, October 2014. Annex A outlines how we reached this estimate. Paul Klein and Gustavo J Ventura, “TFP Differences and the Aggregate Effects of Labor Mobility in the Long Run”, The B.E. Journal of Macroeconomics 7, Issue 1 (2007), 1–38. The Samoan-born population in Australia has grown from an estimated 16 620 in 2005 to 28 540 in 2015, while the Samoan-born population in New Zealand has remained quite static. Department of Immigration and Citizenship, “Community Information Summary: Samoa-born”, https://www.dss.gov.au/sites/default/files/documents/02_2014/samoa.pdf. Department of Human Services, “New Zealand Citizens Claiming Payments in Australia”, https://www.humanservices.gov.au/customer/enablers/new-zealand-citizens-claiming-payments-australia. For a review of the evidence, see Michael Clemens, What Do We Know About Skilled Migration and Development, Migration Policy Institute Policy Brief, September 2013. Michael Clemens, “Skill Flow: A Fundamental Reconsideration of Skilled-Worker Mobility and Development”, Center for Global Development Working Paper No 180, August 2009. What remains of the quota in a given year should be rolled over and added to the next year’s quota. Any new visa category, particularly with the Pacific, would likely be undersubscribed in the starting years as diasporas from within Australia. Rolling over the unsubscribed portion of the quota would mitigate this and ensure that the visa category will bring enough Pacific Islanders over by 2040 to have the desired impact. When Papua New Guinea is left in the model the migration numbers are capped at 5 per cent, the same as in the ‘uncapped’ model. The migration numbers do reduce below 5 per cent as per every other country. Levin, “Micronesian Migration in Historical Perspective: Based on FSM 2010 Census of Population and Housing and other Studies”. The 14 387 are just those who were born in the Marshall Islands. It does not include the children of migrants who were born in the United States, and so is an underestimate of the number of the population ‘lost’. New Zealand Foreign Affairs and Trade, “Cook Islands”, https://www.mfat.govt.nz/en/countries-and-regions/pacific/cook-islands/. See United Nations, Department of Economic and Social Affairs, Population Division, World Population Prospects: The 2015 Revision. Available from the Australian Bureau of Statistics, ABS.Stat, http://stat.abs.gov.au/. Except, perhaps, for Samoans, who appear to be entering in large numbers on a 444 visa via New Zealand. ABS, “3418.0 – Personal Income of Migrants, Australia, 2011–12”, http://www.abs.gov.au/ausstats/abs@.nsf/mf/3418.0. This is the average growth of GDP per capita in the OECD’s long run GDP projections. ABS, “6333.0 – Characteristics of Employment, Australia, August 2015”, http://www.abs.gov.au/ausstats/abs@.nsf/mf/6333.0. Commonwealth of Australia, 2015 Intergenerational Report: Australia in 2055. Andreas Lichter, Andreas Peichl and Sebastian Siegloch, “The Own-Wage Elasticity of Labor Demand: A Meta-Regression Analysis”, European Economic Review 80, Issue C (2015), 94–119.